We design and build a very limited number of custom, adult sized Hobbit Hole cabins. They are typically for customers who want a Hobbit Hole designed for comfortable use in three seasons or year round that can be heated and/or cooled. They are an additional "living space" for a wide variety of uses: home office, studio, study, guest room, etc. 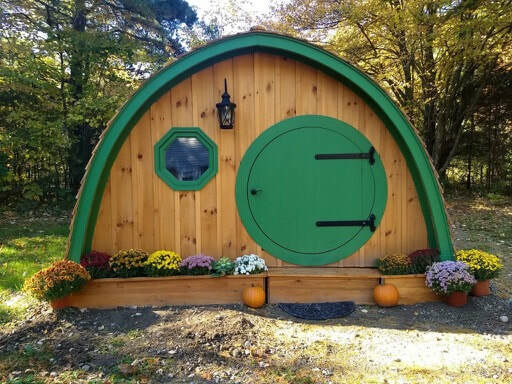 The size of these custom Hobbit Holes are usually in the range of 120 to 150 square feet. We only accept 2-3 custom Hobbit Hole projects per year, and the lead time on projects is usually in the range of 4-6 months. We will bring the building pre-built, so accessibility to your site is a major consideration for project feasibility. Please contact us if you are interested in getting a quote for an insulated Hobbit Hole cabin. To give you a quote we will need to know: 1. Where you are located; 2. The nature of your site accessibility; and 3. The size of Hobbit Hole you desire. To give you a quote we will need to know: 1. Where you are located; 2. The nature of your site accessibility; and 3. The size and style of Hobbit Hole you desire and/or your intended use for it. We look forward to talking with you!